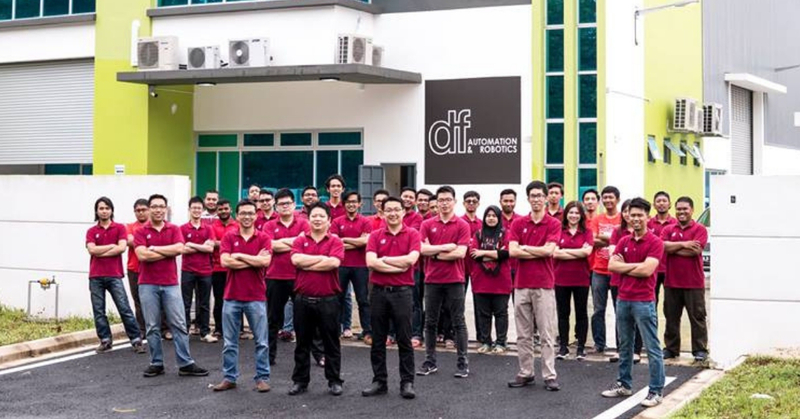 DF Automation & Robotics is a Malaysian tech-based company that produces automation and robotics. The business specialises in designing, manufacturing, marketing, and consistently improving Automated Guided Vehicles (AGV) systems for various kinds of industrial and commercial use. Although most of the products are light and easily moved around, sometimes operators have to deliver goods as heavy as 500kg and walk up to 3km per day. This can be tiring and hazardous for the operator in the long run and not many want the risks associated with the job. Furthermore, it will also be a big challenge for the factory to hire workers due to the above-mentioned factors. Hence, this is where robots or so called Automated Guided Vehicles (AGVs) come in to assist humans in their jobs. Today, it’s relatively common to actually see humans and robots working hand-in-hand to move goods as seen in American multinational technology company Amazon’s fulfillment centre. But although common in more developed countries, it’s rare to see AGVs in Malaysian factories, meaning that most factories still hire operators to move goods. So hoping to make a change and to make Malaysian-made “robots” more widely known throughout the world, Dr. Yeong Che Fai—a lecturer at University Teknologi Malaysia—along with his students Ricky Yap and Tan Ping Hua started Johor-based DF Automation & Robotics. For those who are still unsure as to what AGVs are, they’re industrial mobile robots that move autonomously on their own while carrying loads. An AGV is actuated by DC Motors and equipped with electronic components such as sensors, motor driver, computer and batteries. The overall AGV body is made of steel or stainless steel to allow it to be used in tough environments. Another important part is the software behind the AGVs and for DF Automation, they have developed their own software called NavWiz (Navigation Wizard) as the brain to operate their AGVs. According to the Dr. Yeong, AGVs have been in market since the 1950’s. But even so, the market has been dominated by the powerhouses of USA, Japan and Germany. Curiously, the Malaysian market has seen a spike in the interest towards AGVs for the last two years thanks to the push by many organisations and the government to increase the awareness of Industry 4.0. In 2018, the AGV industry is valued at USD2.49 billion, but the global AGV market size is expected to reach USD7.28 billion by 2025, according to a new report by Grand View Research. 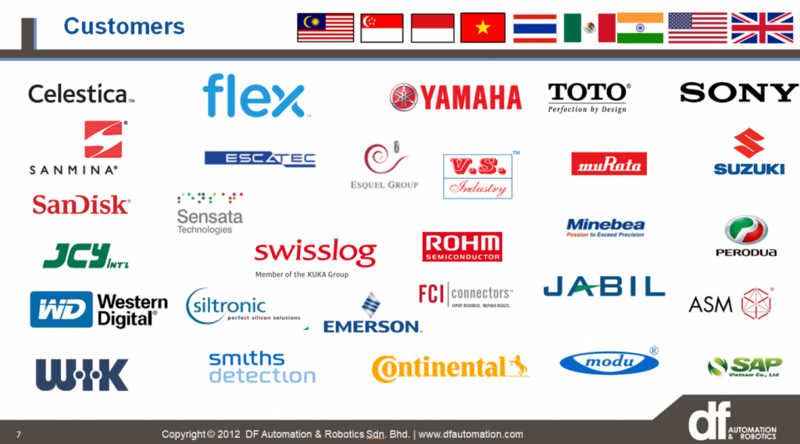 Customers of DF Automation & Robotics. DF Automation & Robotics’ main customers are from the Electronic Manufacturing industry where they traditionally use AGVs to transfer loads from warehouse to production lines, or from finished goods to warehouses. This particular F&B-purposed robot is much smaller in size compared to their standard AGVs and is powered by NavWiz. Although they have a number of clients with them, they still face competition from AGV manufacturers based in China that provide cheaper AGVs but with less features. “These Chinese AGVs are useful for simple tasks, but when they face more complex and complicated solutions, they are often are not able to perform,” he explained. On the other hand, DF Automation & Robotics also faces competition from the more premium AGV market in Japan, Denmark, and USA. Hence Che Fai wants to position the brand between the low cost and premium market. Che Fai and his team actually build and develop every AGV from scratch, including having spent close to 3 years developing the NavWiz software. In the past they took around 1 to 1.5 years to develop a new AGV model but as of now thanks to their NavWiz software and experience that they’ve gained, they can produce a a new simple AGV model in 3 months while it can take up to 6 months for more complicated AGVs. They’ve also recorded positive growth from 2016 with at least 80% total revenue growth per year. Furthermore, they’re also already profitable and revenue is said to be approximately in the tens of millions of ringgit. 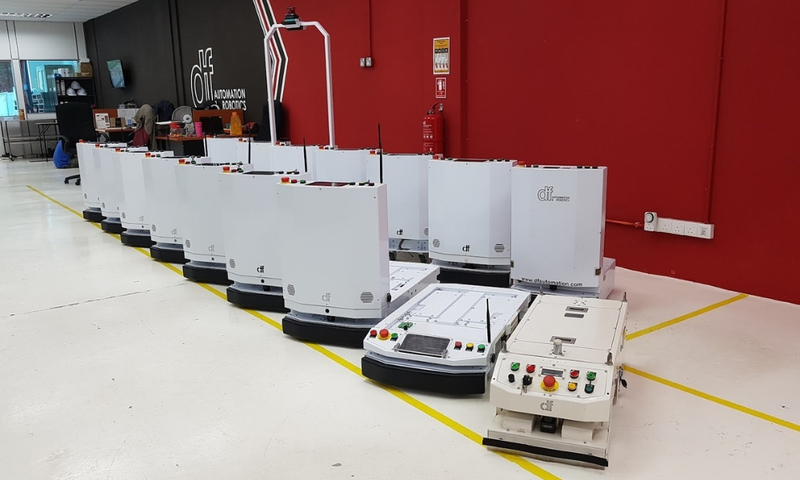 This is all no surprise as DF Automation’s AGVs can range from RM70,000 to RM300,000, depending on the requirement and application. There will also be additional cost if customers would like their AGV system to be integrated with other machines, robots, and lifts. As for his current plans, Che Fai stated that they’ll focus expanding in Southeast Asia—especially Indonesia, Thailand, and Vietnam. “We will start to venture to the European market by the end of this year and to the American market the following year,” he said. Although he is the chairman of the company, he still continues to lecture in UTM as one of the reasons that he ventured into entrepreneurship was to show that a tech company that is built by a Malaysian lecturer and students can become a world class tech company. “In Malaysia and basically most other countries, we need SMEs to support the economy, and if DF becomes successful, it can inspire many Malaysians to venture into entrepreneurship and build many world class companies—just like what the Silicon Valley does,” he said. With the hopes of listing DF Automation & Robotics in 5 years, he wants the business to be the leading robotic maker in the region and to be a success story for other SEA-based tech companies. If you would like to find out more about DF Automation & Robotics, you can check out their website here and social media here.